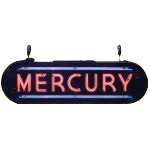 This antique neon sign is oval-shaped and advertises the Mercury car brand. The sign is black with pink neon text. 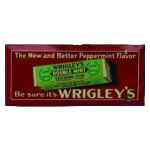 The text is bordered on the top and bottom with a purple neon line.